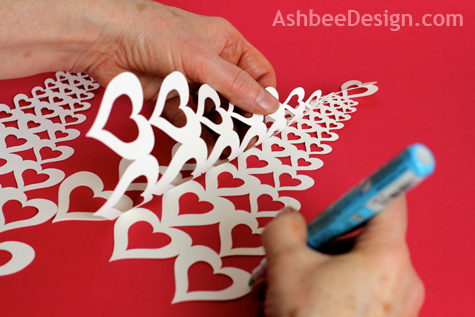 My new supply of card stock came in so I can make another valentine tree and take pictures of the process. I often work that way. I make an entire project and then go back and replicate it for the camera, especially on items that I may want duplicates of for a table centerpiece. I shared this project with you a couple of days ago because I was excited and couldn't wait. Today I made the tutorial. Before we begin please forgive my dirty hands. I am in the middle of three projects today and I have been experimenting with layers of stain. Yes my fingers are orange and covered with spray glue - but that's another project for another day. 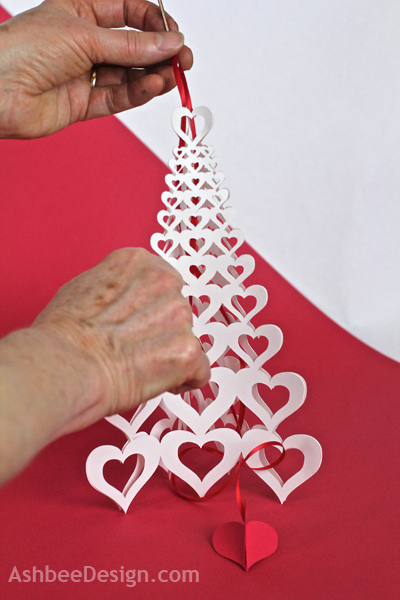 Today is the Valentine Tree Tutorial! 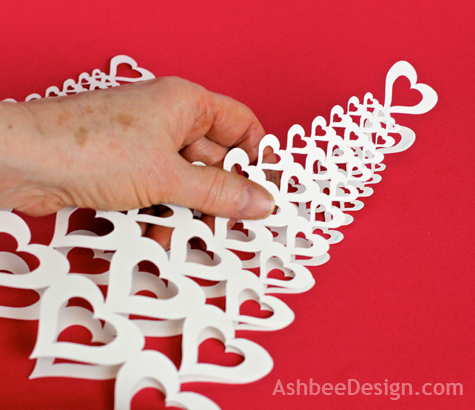 I made the smaller open heart variety for this tutorial. Create your cutting pattern on the Silhouette using their software. I used 1 heart shape and replicated it for each row. I grouped the row, duplicated it and reduce the size. I built the tree by repeating that process. 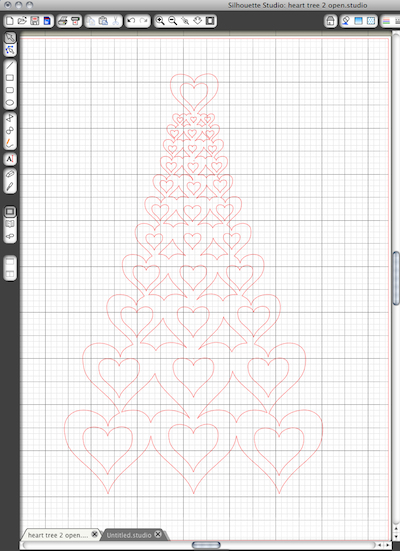 I then used the weld tool in the software to merge all the hearts together. 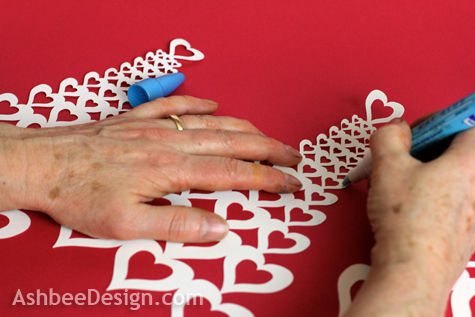 I added another layer of interior hearts for cut outs. 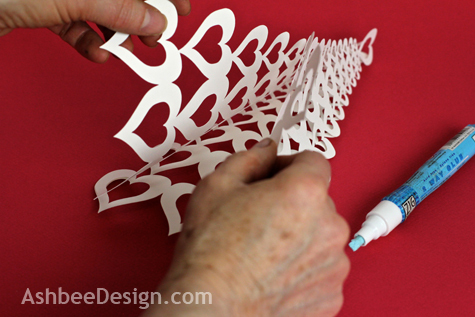 Cut three trees out of white card stock using the Silhouette cutting machine. Separate the tree from the cutting mat. 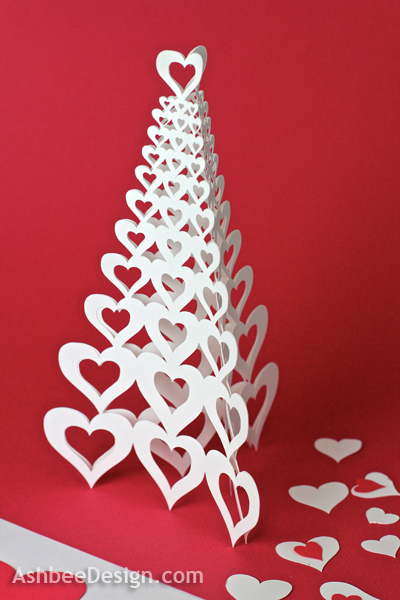 Take 1 tree and quickly dab glue onto the tips of every heart along one side. 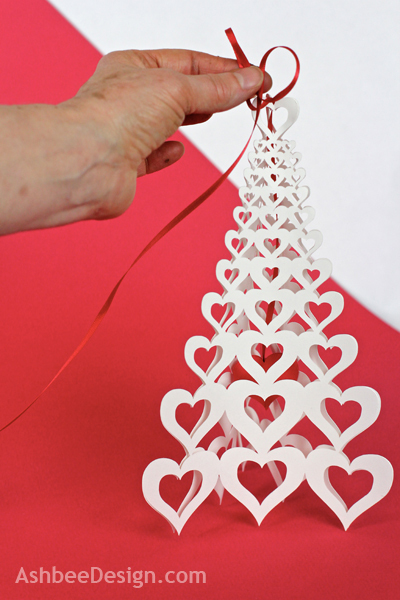 Before the glue dries place a second tree cut-out on top, lining up the hearts. Press together and wait a little while for it to dry. Turn it over and lift up the top tree and again place a line of glue along the outer edge of one tree. Place the third tree on top of that row of glue dots. Separate the two tress on top and put a row of glue spots along the last seam. You are glueing the three trees together. If you are careful and don't bend the trees back, a graceful curve will form for each tree. Once the trees are together, move on to making the red decoration in the center. In this one I created a suspended heart. 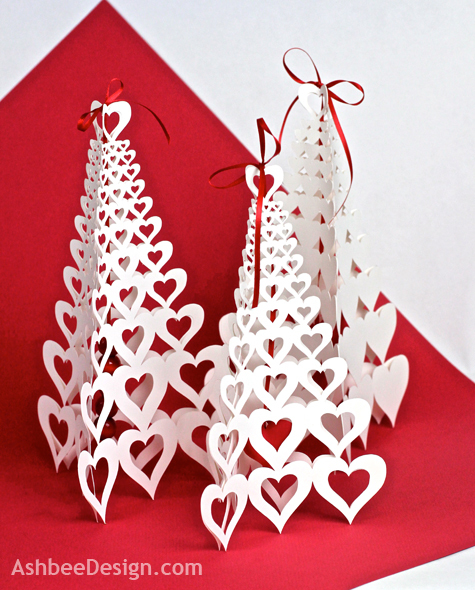 It is made from 3 matching hearts cut out of card stock. Fold all 3 hearts in half. 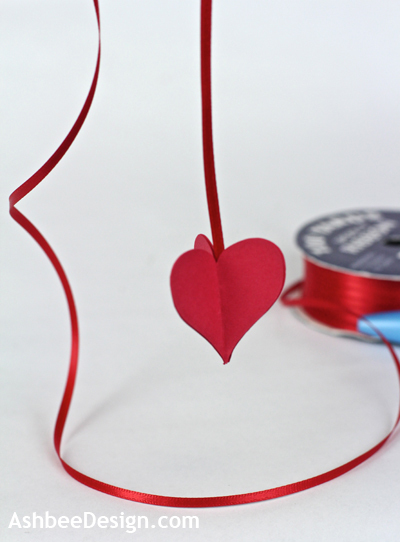 Glue a length of red satin 1/8" ribbon (about 15") to the center of one of the folded hearts. 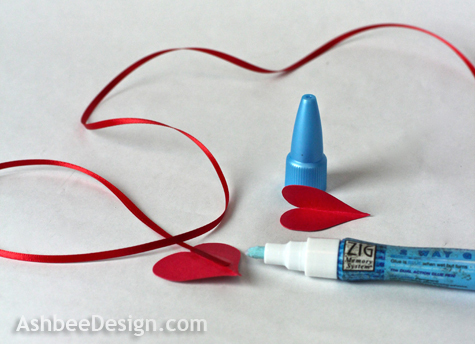 Glue the other hearts together with the first one creating a 3-d heart hanging on a red ribbon. Thread the red ribbon onto the long needle and thread that up through the center of the tree. 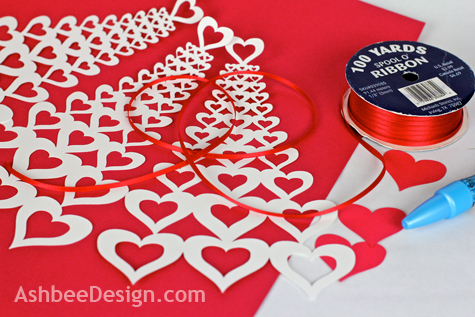 Tie the top off in a bow so the red heart in the center hangings about 1" up from the bottom. Create a series in different sizes. Other variations I tried include leaving the hearts solid and hanging 1/2" red beads in the center. I like them all! Beautiful! Yet another reason to get a Silhouette! OH WOW!!!!!! The tree is AMAZING!!!!! I love this tutorial. Great job on this--I'm dying to try it. Wow! Thanks for all the comments. I am loving my Silhouette cutting machine. It has inspired a new direction of creativity for me so expect more to come! These are amazing. And I have a Silhouette too! Thanks everyone for all the wonderful comments. This afternoon I am working on my Silhouette again designing something new. We'll see if it is successful or not... I'll keep you posed. Beautiful! Pinning. I just got a Silhouette, but I haven't been able to try it yet. Thanks for the idea! This is beautiful. You did a super great job of showing how tto make it . Thanks a million.